The lovely city of Bologna is home to many beautiful red buildings, a leaning tower to rival Pisa’s, and miles and miles of medieval arcades. Bologna is also home to the oldest university in Europe, whose students have included Dante, Aquinas, Petrarch, Thomas a Becket and Copernicus, and whose faculty now includes The Man Himself: Umberto Eco. As if all of that weren’t enough, Bologna is also the culinary capital of Italy. It is a town of serious foodies that takes great pride in its culinary traditions. The Bolognese invented tortellini (they lay claim to lasagne as well), and they have become famous around the world for tagliatelle al ragu, otherwise known as spaghetti bolognese, and for mortadella, otherwise known as…well, bologna. Bologna also happens to be just down the road from Modena (as in aceto balsamico de…) and Parma (as in Parma ham and parmesan cheese - two of the finest foods to be found on God’s green earth). 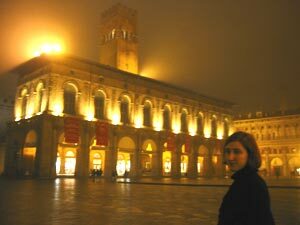 It was with all of this in mind that, late in November 2003, Jeremy and I set off for a weekend in Bologna. We went as culinary tourists, and our mission was to eat as many of the local delicacies as possible within just three days, with frequent espresso breaks to keep us going and brisk jaunts around the medieval streets to work off the copious amounts of food we planned to devour. Our mission got off to a splendid start: as soon as we arrived in Bologna on Friday evening, we hit the streets in search of dinner. And what a dinner we found: somewhat half-unwittingly, we wandered into one of Bologna’s most famous restaurants, Pappagallo. We braved the Italian menu and the recommendations of the waiter and ended up with some of the finest, richest, yummiest food imaginable. My starter alone was worth the trip to Bologna: a plate of culatello, which is something like the more illustrious brother to Parma ham (if you can imagine such a thing), served with a dollop of fig compote and a dollop of something that tasted like parmesan cheese but had the consistency of a thick, creamy ricotta. Taken individually, these ingredients tasted fantastic; taken together, they were utterly sublime. This dish had what was probably the most perfect balance of flavors of anything I have ever eaten. This was followed by a second starter of pasta, in this case the famous Bolognese tortellini served in brodo, or in a delicious, light broth. Jeremy tried the tagliatelle al ragu, which he was to have two more times over the course of our next two days in Bologna. After all these starters, the main meal was served. I, somewhat insanely, chose the fritto misto, or “mixed fried foods”, which consisted of various pieces of meat, shredded zucchini, ricotta and polenta dumplings, and pieces of apple and banana, all coated in a light, crispy breading and fried golden brown. Jeremy took the waiter’s suggestion and had a veal cutlet which was wrapped in Parma ham and topped with freshly shaved white truffle (which they had gotten specially that day). When we reached the point where we felt like we were going to explode if we ate another bite, we threw caution to the wind and ordered dessert (the two bottles of wine we drank with dinner must have weakened our resolve not to eat until we were sick). Jeremy braved the mixed cheese plate, but all I could manage was a lemon and vodka sorbet - and even that nearly did me in. To top it all off, we got complimentary cornmeal cookies with our espressi, which I could only stare at while moaning, “I will never eat again…” I have never, ever, ever been so full in my life.